Discussion in 'Bass Area; The Bottom Line' started by Texsunburst59, May 16, 2008. First of all I don't play or collect Basses at all. I collect Guitars and amps. My son plays bass. I do know a vintage instrument when I see one. 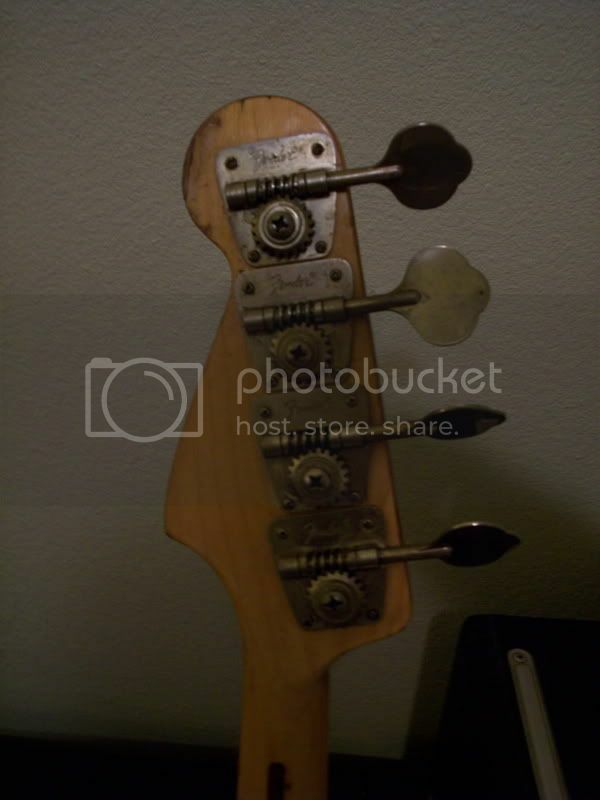 Anyway I visited on of my regular pawn shops today,and to my amazement they had this vintage bass and were asking $59.99 for it. I didn't know at the time it was a '74,but I knew by the look of it that is was either a late 60's or early 70's. I tried to get them to come of the asking price but they wouldn't. 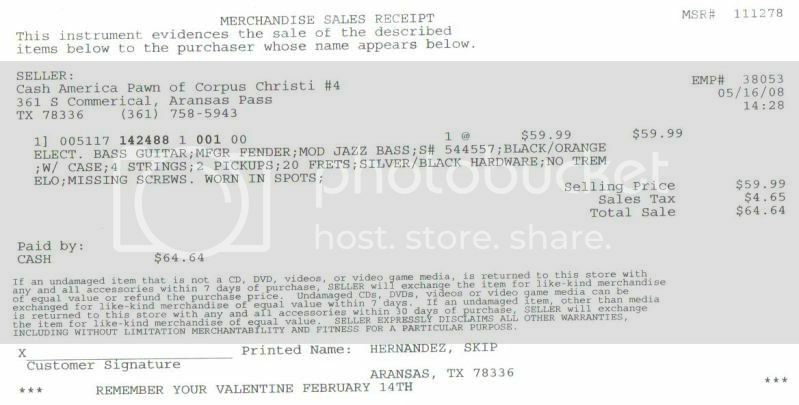 I went ahead and bought it for $64.64 out the door. 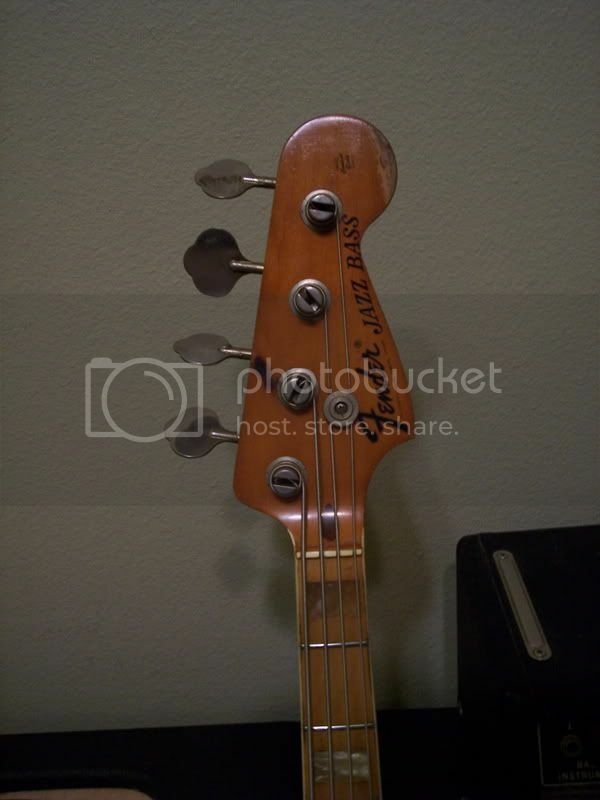 I got home and eventually found out it is was a '74 Jazz Bass. I'm going to give it to my son for his as on of his High School Graduation gifts. I still amazed that I was able to snag this baby for so little. By the way, this thing is REALLY Reliced. It's been beat to hell,but is has a really cool look.The serial number # 544557 dates it as a '74. Anyway, here are some pics of the bass. I tried to get them to come of the asking price but they wouldn't. Great score. Glad to read great scores do still happen. Wow, that's a nice score! Congrats! omg... 4-bolt 70's jazz, actually doesn't look all that bad considering! It is pretty rare these days for pawn shops to make this kind of mistake. Not to rain on your parade, but I have to wonder if it was stolen and they knew it? I like how it lists the color as black/orange. Wow. I am very impressed!! Hard to go wrong in any way at that price. You'll spend more buying a set of new strings and having a guitar tech set it up properly. Pretty cool score. 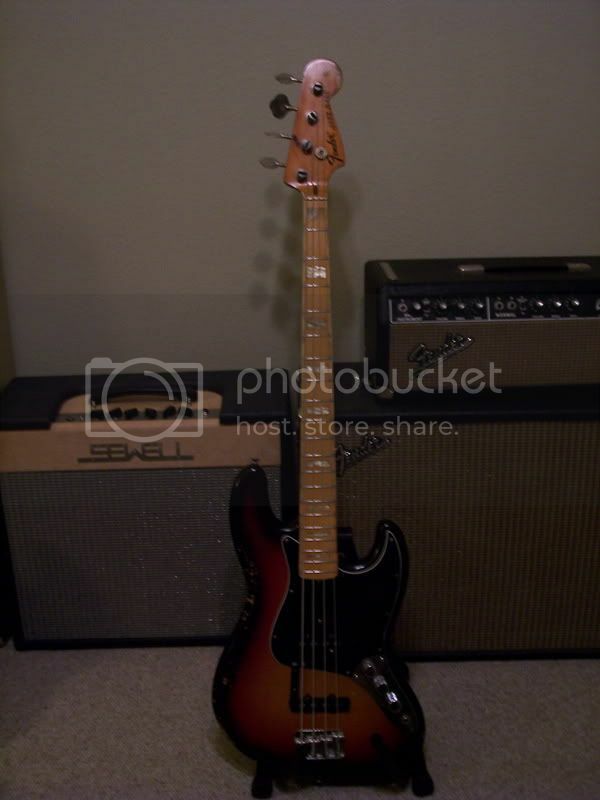 I'm not even a Jazz bass guy but for that price I would've bought it anyway. Just make sure your son doesn't add any more cigarette burns to that headstock. yeah, I figured with the ease of price checking on the internet these days pawn shop scores were long over. It's clearly modded cosmetically. Any changes with the electronics? 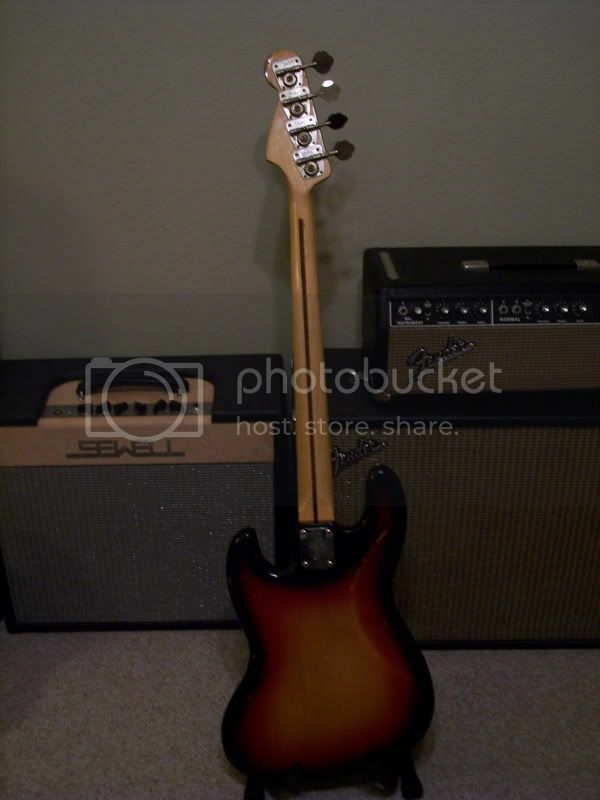 Anyway, congratulations on getting an awesome free bass. And yes when you could flip it for 31X the sale price instaneously ($2000 convservative estimate) it's free. Absolutely amazing! Where do they get off pricing it at $59??? Even a clueless pawn shop should have it at $200 or $300. 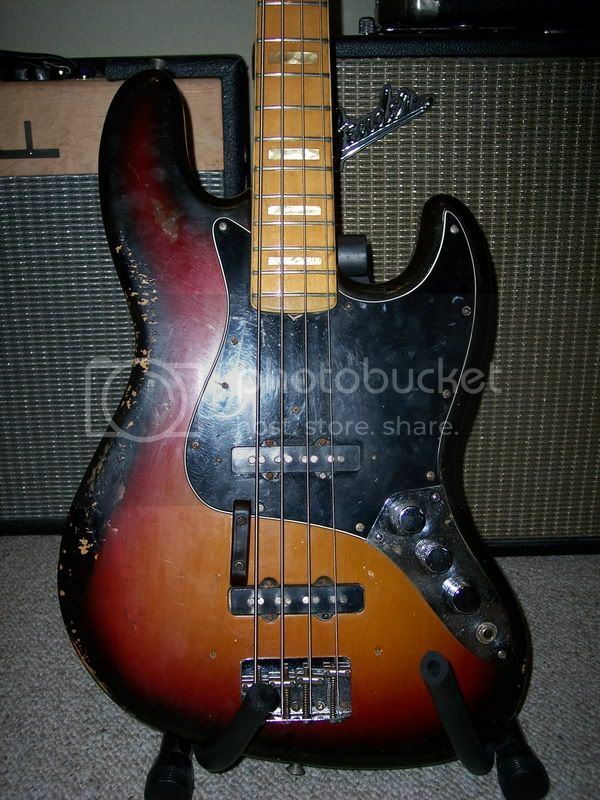 Geddy Lee got his 72 jazz for $200 in a pawn shop in the 70s. This would be like him getting it for 10 bucks back then. Amazing. What a find. Great score! about the price of a tank of gas! Great catch man! Incidentally, wanna triple your money? Nice bass! I posted a reply yesterday. HMMMMM....must have broken some rule or something. I guess censorship does exist in the United States or at least on the Gear Page! I guess censorship does exist in the United States or at least on the Gear Page!